Orb fixtures create an eclectic and modern look. 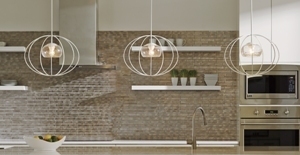 Open, spherical pendants, such as those pictured above, eliminate shadows by casting light both up and down. FIXTURE FOCUS: Make a statement with a standout fixture. Think of a beautiful light fixture as art for your home. A distinctive piece can be the main focus around which a room's furnishings are designed. For example, a chandelier can be sized proportionately to a room or table, or it can be oversized to make a room-focusing statement. The fixture, pictured at right, stands out, even when competing against an incredible outside view. Visit ALA online for more home lighting design tips. BRIGHT TIPS: Look to Lighting magazine for design inspiration. Lighting magazine is full of illuminating design ideas for your home. The 2016 issue features inspirational photos and design tips for creating a beautiful space that is uniquely your own. For example, in an expansive space, the lighting will be most effective if it comprises a mix of fixtures sizes and types, which will provide ample light to suit a variety of needs. The kitchen, pictured at left, combines recessed cans, pendants and a mid-size chandelier for a bright, useful space. About how long will an LED bulb last? -Mary S.
According to the Department of Energy, a good-quality LED bulb will last about 25,000 hours. That is 25 times longer than a traditional light bulb, which is the equivalent of 24 hours a day, seven days a week for three years.